Midway through the first quarter, Washington linebacker LaVar Arrington's 21-yard interception return set up running back Clinton Portis' six-yard touchdown run. Then, Redskins linebacker Marcus Washington recovered Tampa Bay running back Carnell Williams' fumble and returned it seven yards before losing it himself – into the arms of safety Sean Taylor, who then ran 51 yards for the Redskins' second touchdown. In the third quarter, Mark Jones gave the Buccaneers the ball at their own 49-yard line on a 24-yard punt return. Tampa Bay's offense then went on a 7-play, 51-yard drive that ended with quarterback Chris Simms' two-yard touchdown run. In the fourth quarter, Tampa Bay drove to the Redskins 19-yard line, but linebacker Lemar Marshall tackled fullback Mike Alstott for no gain on third down and 1, and then Simms threw an incomplete pass on fourth down. Buccaneers defensive back Brian Kelly intercepted a pass from Mark Brunell on the Redskins' next drive and returned it the Redskins 35-yard line. With 3 minutes left in the game, Tampa Bay wide receiver Edell Shepherd caught what appeared to be a 35-yard touchdown reception, but he lost control of the ball as he was coming down in the end zone for an incomplete pass. The Buccaneers got one last chance to tie the game when they received a punt at their own 46-yard line with 1:05 left in regulation, but Simms threw a pass that was tipped at the line of scrimmage and went into the arms of the Redskins' Marcus Washington for a game-ending interception. As of 2016, this is the Redskins' last playoff victory. The three-time Super Bowl champion Patriots, who for the first time in their previous three playoff trips would have to win three games to advance to the Super Bowl, defeated the Jaguars 28–3. Linebacker Willie McGinest set NFL playoff records for sacks in a game (4.5, 1 ahead of the old record held by Richard Dent and Rich Milot) and career postseason sacks (16, two ahead of the old record held by Bruce Smith), while quarterback Tom Brady threw for 201 yards and three touchdown passes. In the first half, the Jaguars recorded four sacks and held New England to 126 yards, while the Patriots defense recorded two sacks, gave up only 115 yards, and did not allow a first down until 9:40 remained in the second period. Neither team could score in the first quarter, but early in the second, New England receiver Tim Dwight returned Chris Hanson's 46-yard punt 27 yards to the Jaguars 37-yard line. Two 4-yard runs by Corey Dillon and an 18-yard burst from Kevin Faulk then moved the ball to the 11-yard line, and Brady capped off the drive with an 11-yard touchdown pass to Troy Brown. On Jacksonville's ensuing possession, Jimmy Smith's 19-yard reception gave his team a first down for the first time in the game and moved the ball to the Patriots 44-yard line. But on the next play, a tackle from safety Eugene Wilson caused Alvin Pearman to fumble the ball, and defensive lineman Richard Seymour recovered it. However, the Patriots could not take advantage of the turnover; Jacksonville managed to force a punt and then drove into scoring range for the first time in the game. Quarterback Byron Leftwich completed five passes for 59 yards on the drive, and Josh Scobee finished it with a 36-yard field goal, cutting their deficit to 7–3. After the kickoff, Faulk's 21-yard reception moved the ball to midfield and gave the Patriots a chance to increase their lead before halftime, but receiver Deion Branch dropped a pass from Brady at the Jaguars 10-yard line with 19 seconds left. After forcing Jacksonville to punt on the opening drive of the second half, Brady led the Patriots 81-yards in 12 plays. On the 11th play, they nearly turned the ball over when tight end Benjamin Watson fumbled the ball on the Jaguars 5-yard line, but receiver André Davis recovered the ball, and Brady threw a 3-yard touchdown pass to David Givens on the next play. Then after forcing a punt, Brady threw a short pass to Watson who broke several tackles en route to a 63-yard score, increasing New England's lead to 21–3. After the kickoff, Leftwich led his team to the Patriots 32-yard line, but on the first play of the fourth quarter, defensive back Asante Samuel intercepted Leftwich's pass and took off for a 73-yard touchdown return, making the score 28–3. After that, Jacksonville mounted two more drives, but could not come away with any points. First they drove to the Patriots 8-yard line. But on third down and 2, McGinest sacked Leftwich for a 15-yard loss and Scobee missed a 41-yard field goal attempt on the next play. Then after forcing a punt, they drove to the Patriots 6-yard line, but ended up turning the ball over downs with 5 minutes left in the game. This game also marked three career playoff records: Brady and Patriots head coach Bill Belichick set records for 10 straight postseason victories, eclipsing Vince Lombardi's run with the Green Bay Packers in the 1960s. Carolina dominated the second half, intercepting Eli Manning three times. Midway through the third quarter, Ken Lucas intercepted a pass from Manning and returned it 14 yards to the Giants 12-yard line, setting up Smith's 12-yard touchdown run on the next play. On New York's next drive, a 17-yard pass interference penalty on Lucas nullified his second interception and gave the Giants a first down at the Panthers 43-yard line. But two plays later, Manning's pass was intercepted by Marlon McCree at the 18. On the Panthers ensuing drive, Foster rushed three times for 44 yards, and Delhomme completed a 25-yard pass to Keary Colbert, moving the ball to the Giants 27-yard line where Kasay's 45-yard field goal made the score 20–0. Then five plays after the kickoff, McCree recorded his second interception on the Panthers 44-yard line. Carolina subsequently closed out the scoring with a 14-play, 55-yard drive that ended with Kasay's third field goal with 2:40 left in the game. On the Bengals second offensive play of the game, Palmer suffered a season-ending knee injury after being hit by Pittsburgh's Kimo von Oelhoffen, but his 66-yard pass to wide receiver Chris Henry (who was also injured on the play) set up kicker Shayne Graham's 23-yard field goal. Then after forcing a punt, backup quarterback Jon Kitna completed 3 consecutive passes for 40 yards and rushed for 11, while running back Rudi Johnson finished the drive with a 20-yard touchdown run, increasing their lead to 10–0. Steelers defensive back Ike Taylor returned the ensuing kickoff 36 yards to the 40-yard line. Aided by a 15-yard penalty on cornerback Tory James, the Steelers subsequently drove 60 yards in 8 plays and scored with Ben Roethlisberger's 19-yard touchdown pass to Willie Parker. The ensuing kickoff was returned by Tab Perry for 32 yards to his own 43-yard line, and then the Bengals drove 57 yards in 14 plays. Kitna completed the drive with a 7-yard touchdown pass to T. J. Houshmandzadeh, retaking their 10-point lead, 17–7. But on the Steelers ensuing drive, Roethlisberger's 54-yard completion to Cedrick Wilson set up his 5-yard touchdown pass to Hines Ward, cutting the score to 17–14 at halftime. Cincinnati took the second half kickoff and advanced the ball 62 yards to the Steelers 15-yard line. Graham attempted a 34-yard field goal but center Brad St. Louis' high snap sent the ball over holder Kyle Larson's head. Graham recovered the fumble, but the Steelers took over on the 34-yard line. On the seventh play of the drive, defensive back Kevin Kaesviharn committed 40-yard pass interference penalty on the Bengals 5-yard line, and Jerome Bettis ran the ball into the end zone on the next play. The Seahawks took the opening kickoff and drove to the Redskins 11-yard line, but then Alexander lost a fumble without being touched, and linebacker Lemar Marshall recovered it. After that, the two teams were forced to punt on all their possessions in first quarter, and with 5:28 remaining, Alexander was knocked out of the game. After the ensuing kickoff, Brunell's 52-yard completion to Chris Cooley moved the ball to Seattle's 24-yard line. Three plays later, he threw a 20-yard touchdown pass Santana Moss, a throw that bounced off the shoulder of Seattle cornerback Andre Dyson into Moss' arms. Washington got the ball back when Hall recovered a fumble from Josh Scobey at the Seahawks 40-yard line on the ensuing kickoff. But the Redskins drive stalled at the 18-yard line and ended with no points when Hall missed a 36-yard field goal attempt. Early in the second quarter, the Broncos drove to the Patriots 3-yard line, only to turn the ball over on downs after failing to convert a fourth down and 1 on New England's 3-yard line. Then after forcing a punt, Broncos quarterback Jake Plummer threw a pass that was intercepted by Asante Samuel. On the next play, Patriots quarterback Tom Brady threw a 51-yard completion to André Davis setting up Adam Vinatieri's 40-yard field goal to give New England a 3–0 lead. Early in the third quarter, the Patriots drove 58 yards in 11 plays and scored with a 32-yard field goal from Vinatieri, cutting their deficit to 10–6. With less than a minute to go in the third quarter, New England reached the Denver 5-yard line. However, Brady was intercepted for the first time in the playoffs since Super Bowl XXXVIII. The interception was returned by Champ Bailey for 101 yards before New England tight end Benjamin Watson knocked the ball out of bounds at the New England 1-yard line. The Patriots challenged whether the ball was actually knocked through and out of the end zone (which would have been a touchback and given the Patriots the ball at their own 20-yard line), but the original call stood. Mike Anderson then ran for another one-yard touchdown on the next play to make it 17–6. Then on New England's next drive, the usually accurate Vinatieri missed a 42-yard field goal, his first in 21 field goal attempts in the playoffs. Later in the fourth quarter, Troy Brown muffed a Denver punt and the Broncos recovered it on New England's 15-yard line, setting up Rod Smith's four-yard touchdown pass from Plummer. With 8:33 left in the game, Brady completed a 73-yard pass to Deion Branch and then followed it up with a 4-yard touchdown pass to David Givens, cutting the score to 24–13. But on the Broncos ensuing possession, Plummer's 42-yard completion to Smith set up another Elam field goal. Denver then all but clinched the game when safety John Lynch intercepted a Brady pass with less than 3 minutes left. Late in the third quarter, Steelers linebacker James Farrior (who finished the game with 8 tackles and 2.5 sacks) sacked quarterback Peyton Manning at the Colts 1-yard line on third down, and Randle El returned Hunter Smith's ensuing punt 20 yards to the Indianapolis 30. Five plays later, Jerome Bettis scored a 1-yard touchdown run, making the score 21–3. But this time, Indianapolis struck back, driving 72 yards in six plays and scoring with Manning's 50-yard touchdown pass to tight end Dallas Clark. The Steelers were forced to punt on their ensuing drive, but only after taking over 7 minutes off the clock, leaving just 6:03 left in the game by the time Indianapolis got the ball back. At this point, the game appeared to be over. However, the Steelers were forced to advance the ball towards another score instead of taking a quarterback kneel because the Colts still had three timeouts remaining. But on Pittsburgh's first play, in which Bettis tried to punch it in for an insurance touchdown, he fumbled for the first time all season when linebacker Gary Brackett popped it from Bettis' hands with his helmet. Indianapolis defensive back Nick Harper recovered the ball and appeared to be on his way for an Indy touchdown that would have given the Colts the lead when Roethlisberger made a season saving tackle at the Colts' 42-yard line, spinning around and grabbing his ankle. Eventually, the Colts then advanced to the Pittsburgh 28-yard line, but Vanderjagt, who had been perfect at home in the playoffs, missed a 46-yard game-tying field goal attempt wide right with 17 seconds left, and the Steelers ran out the clock. This game marked the beginning of the end for Vanderjagt, who entered the game as the NFL's all-time leader in field goal percentage. The following year the Colts decided to let his contract expire. He spent the next season with the Dallas Cowboys, where he made just 72% of his field goals before leaving the NFL for good. CHI – Adrian N. Peterson 1-yard run (Robbie Gould kick), 1:57. Panthers 13–7. Drive: 9 plays, 67 yards, 4:29. The Panthers recorded 434 yards of total offense, and avenged a 13–3 regular season defeat by the Bears, to advance to their third NFC Championship Game in their eleven-year existence. Carolina receiver Steve Smith caught 12 passes for 218 yards and 2 touchdowns, the first coming 55 seconds into the contest, and rushed for 26 yards. Panthers kicker John Kasay contributed three second-quarter field goals, while quarterback Jake Delhomme threw for 319 yards and 3 touchdowns. Although the Panthers lost key running back DeShaun Foster to a broken ankle in the third quarter, they still held off the Bears. The Panthers got the ball first and scored quickly. Jamal Robertson returned the opening kickoff 34 yards to the 40-yard line, and one play later, Delhomme threw a 58-yard touchdown pass to Smith. Later on, Smith's 46-yard reception set up a 20-yard field goal on the first play of the second quarter, increasing their lead to 10–0. On their next drive, Carolina had a chance to increase their lead even more after Delhomme completed passes to Drew Carter for gains of 14 and 29 yards, moving the ball to the Bears 23-yard line. But linebacker Brian Urlacher ended the drive by intercepting a pass from Delhomme at the 10. However, the Pathers forced another punt and scored with a second field goal from Kasay. Bears quarterback Rex Grossman completed 5 passes for 62 yards on a 67-yard drive that ended with a 1-yard touchdown run by Adrian N. Peterson cutting the score to 13–7. But Carolina stormed right back, driving 51 yards and scoring with Kasay's third field goal on the last play of the first half. This was the first time since the 1989–90 NFL playoffs that neither conference championship game took place in the Eastern or Central time zone. During that season, the Conference Championship Games were changed from the then-traditional starting times of 12:30 p.m. and 4:00 p.m. to 1:30 p.m. and 5:00 p.m. EST respectively. This was to accommodate the fact that the Denver Broncos and San Francisco 49ers hosted the 1989–90 AFC and NFC championship games in the Mountain Standard Time Zone and Pacific Standard Time Zone, respectively — thus avoiding a locally played game at 9:30 a.m. PST/10:30 a.m. MST, but also forcing the networks to change or move their prime time lineups in a moment's notice. 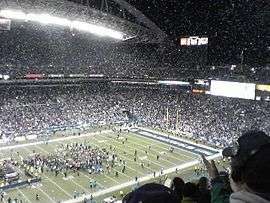 When the league changed the traditional starting times for the 2002–03 NFL playoffs to 3 p.m. and 6:30 p.m. EST, it eliminated the future possibility of having to reschedule. For the first time since 1984, the Steelers did not host the AFC Championship game, but it hardly mattered as they forced four turnovers and went into halftime with a 24–3 lead en route to advancing to their sixth Super Bowl appearance in team history. In doing so, Pittsburgh became the first #6 playoff seed (since the league expanded to a 12-team playoff format in 1990) to advance to the Super Bowl. Second-year quarterback Ben Roethlisberger, already in his fifth career playoff game, completed 21 of 29 passes for 275 yards and two touchdowns (one each to Cedrick Wilson and Hines Ward) and ran for a third. Steelers running back Jerome Bettis rushed for the other touchdown. Pittsburgh scored on their opening drive, moving the ball 62 yards in 12 plays and ending it with a Jeff Reed field goal. Three plays after the kickoff, Broncos quarterback Jake Plummer lost a fumble while being sacked by Joey Porter and Steelers lineman Casey Hampton recovered it at the Denver 39-yard line. Four plays later, Roethlisberger's 12-yard touchdown pass to Wilson increased the Steelers lead to 10–0 on the first play of the second quarter. The Broncos responded by driving 55 yards and scoring with a field goal from Jason Elam. But Pittsburgh stormed right back, marching 80 yards in 14 plays and scoring with Bettis' 3-yard touchdown run to take a 17–3 lead. Then on the first play after the ensuing kickoff, defensive back Ike Taylor intercepted a pass from Plummer on the Broncos 39-yard line. Four plays later, a Bettis touchdown run was called back because a penalty on Ward. But Ward made up for his mistake by catching a touchdown pass on the next play, giving the Steelers a 24–3 lead with 7 seconds left in the half. In the third quarter, Plummer finally got the Broncos moving by completing four consecutive passes for 80 yards, the last one a 30-yard touchdown pass to Ashley Lelie. But Wilson caught 2 passes for 45 yards on Pittsburgh's next possession, setting up Reed's second field goal to make the score 27–10. The Seahawks forced four turnovers, and allowed only 36 rushing yards and 14 points, as they advanced to their first Super Bowl trip in the team's 30-year history. Meanwhile, running back Shaun Alexander, coming off his divisional round injury, rushed for a franchise playoff record 134 yards and 2 touchdowns. The Seahawks scored another 17 unanswered points. On their first drive after the punt return touchdown, that moved the ball 57 yards and scored with a 39-yard field goal from Brown. Brown missed a field goal on the Seahawks next possession, but on the first drive of the second half, they score with Hasselbeck's 20-yard touchdown pass Darrell Jackson. Then in the fourth quarter, they put the game completely out of reach with a 53-yard drive that ended with Alexander's second touchdown. Carolina responded with a 47-yard touchdown pass from Delhomme to receiver Drew Carter, cutting the score to 34–14, but by then there was only 5 minutes left in the game. ↑ "NFL to scrap all-star officiating crews for playoff". Sports Illustrated. Associated Press. 2003-03-25. Retrieved 2007-12-29. ↑ La Canfora, Jason (2006-01-08). "Stop and Go for Redskins". The Washington Post. Retrieved 2010-01-09. ↑ Wise, Mike (2006-01-08). "The Good and the Ugly". The Washington Post. Retrieved 2010-01-09. ↑ Saslow, Eli (2006-01-08). "Offensive Ineptitude Rendered Moot". The Washington Post. Retrieved 2010-01-09. ↑ "NFL: Polamalu overturned interception the wrong call". ESPN.com. Associated Press. 2006-01-17. Retrieved 2010-01-09.